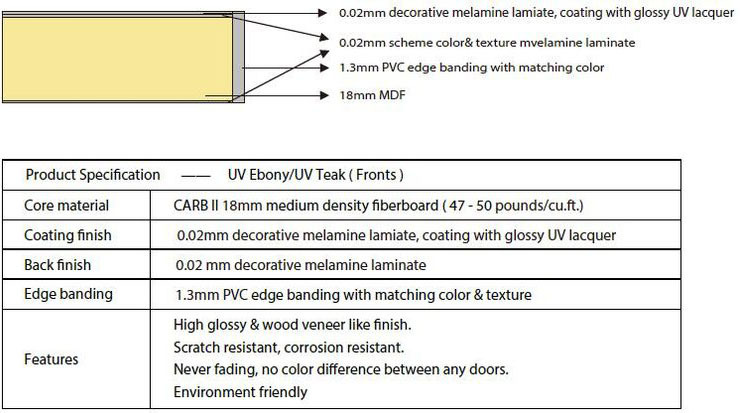 18mm thick plywood board with creamy white color melamine laminate on both sides and PVC edge banding of matching color. All bottom panel and end panel of drawers use 16mm thick plywood board, with creamy white color melamine laminate on both sides and PVC edge banding of matching color. reinforced with nails and glue. Full extension soft close drawer glides. Six-way adjustable 95° degree opening soft close hinges, easy to install. 120mm height adjustable leg, 120mm x 3000mm aluminum alloy toekick, connected with clamp rings; kickboard also optional with 120mm x 2400mm matching door panel material.